A value model shows how actors perform transactions during a period that we call the contract period. You can quantify your value model by attaching estimated values to various diagram elements. This allows estimation of net value flow during the contract period. In the following diagram, the customer needs occurs 50 times, the shops asks € 100 for the products and transport to the customer, and buys this transport for € 20 from a logistics provider. Net value flow analysis tells us that in the contract period, the customer segment spends € 5000 in total, the shops have a total revenue of € 4000 and the logistics market of € 1000. The analysis can be refined by adding the value of the product for customers and shops, and of transport for each of the market segments. In general, net value flow computations can be complicated and we provide free analysis software to do this. The software can also compute the net present value of a series of business models, where for example the first business model represents a startup stage and the next business models represent a sequence of different marketing campaigns. Our tools can do sensitivity analysis to market assumptions by repeating net value flow analysis for different values of market parameters. 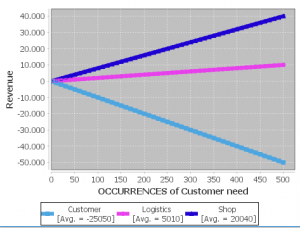 For example, the next graph shows how the revenue of shops and logistics providers, and the expense of customers, varies with number of customer needs in the contract period. In general, revenue may depend in complicated ways on expenses and production costs, and sensitivity analysis provides insight in the dependence of revenues on the size of market segments and the number of occurrences of customer needs.